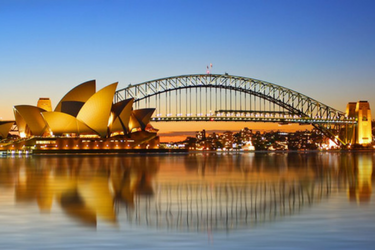 Lindt Excellence sought a campaign to engage customers, drive trial and increase sales – but in a way that would promote loyalty. TLC Marketing Worldwide proposed a promotion to reward all customers – adding value to the transaction and ensuring the gift adhered to the brand’s image, while also resonating with the customers’ true affinities. Chocolate is often enjoyed in the evening, surrounded by sights, sounds and words that evoke serenity. The result: ‘Enhance Your Evenings’. 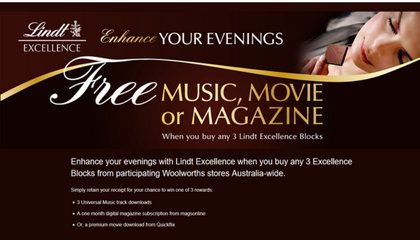 During August 2016, customers were invited to enjoy the music, movie or magazine of their choice, courtesy of Lindt Excellence. Customers were offered three MP3 tracks to download, a free movie to stream or a free magazine subscription with the purchase of three blocks of chocolate. Post-purchase, customers uploaded their receipts to a custom website, which upon verification, randomly allocated their reward from a participating reward partner by issuing a voucher. The vouchers then redeemed the music, movie or magazine of their choice. ‘Enhance Your Evening’ was designed to fit into Lindt’s broader ‘Evenings of Excellence’ campaign, and was featured on the website for the campaign duration. It was advertised using POS displays, which were placed in hundreds of Woolworth’s stores across the country, a Woolworths Catalogue advert and Lindt Facebook content rounded out the advertising for the campaign. While TLC did not create the advertising, we developed the insights that drove the campaign reward selection, built and maintained the redemption website, and handled all customer inquiries regarding the redemptions. The promotion was a huge success, achieving in an increase in units sold in comparison to a similar time frame in which a price promotion offered. As a result of the success, the client immediately retained TLC Marketing Worldwide to repeat the promotion in 2017. The creative agency was DBG Creative Agency.